Fight Club is David Fincher’s 1999 classic which is listed as an all-time great and is a certainty to be found on many peoples personal favourite films lists; however it’s not only it’s iconic story, great characters and extraordinary film-craft which makes Fight Club stand-out, it is the extreme detail in which it dives into, become not only a modern-classic; but a post-modern filmmaking master class. Its display of post-modernism is highlighted as within the opening sequences, before we are officially introduced to Tyler Durden (Brad Pitt), a series of subliminal styled flashes occur showing our character, the idea that it is post-modern is due to how Tyler himself shows us later within the film how filmmaker’s can achieve subliminal messages. As we find out later in the film, its Jack (Edward Norton) who creates Tyler as a manifestation of his sub-conscious, to cover-up and to cope with his unhappiness due his slowing fading life which is looked at as pointless; however the very moments where Tyler flashes on screen is carefully orchestrated and very telling. The Office is the first time we see Tyler Durden; his expression is very confused and dazed; as if he had just fallen into a different universe wondering where he is. Jack’s lines “Everything is just a copy, of a copy, of a copy” as he scans work through a photocopier, it’s all very telling, urging us to realise Jack has just made Tyler! Tyler is just a copy of Jack; they are the same people! Tyler is then seen next in the Hospital, the doctor tells Jack “Swing by First Methodist Tuesday nights. See the guys with testicular cancer. That’s pain.” but Tyler stands behind with a grin, almost laughing at him. Is he laughing at Jack’s issues? The Doctors advice? or simply the idea that people think they know what pain and trouble is. Tyler carries on mocking our cast and characters, this time in the Therapy Sessions he appears, the leader orders “Let’s all of us follow Thomas’s example and really open ourselves up.” Tyler with his arm around the guy, looking smug but once again a face of ridicule; thinking to himself Jack’s not going to find answers here; these aren’t men! Tyler then stands in between Marla and Jack as the pair seem to walk away and gaze at each-other after a very textbook meet-cute. He’s obstructing them, showing Jack the one thing he make’s him promise later on.. Stay away from Marla! Then Tyler appears in Jack’s hotel welcome video, he is on the far right on the front row, screaming welcome almost telling the audience he is soon to appear, as Jack slowly looses hope. Then we see Tyler, not a flash but a long drawn out shot just before the two officially meet. He’s wearing his hyper-real clothes, but the way it is filmed is important, Tyler almost emerges out of thin air but more so straight from Jack’s body as the two pass on the escalator! The camera then follows Tyler all the way up as if he was our main character. Then Tyler and Jack finally meet side by side on the plane and the first line Jack says is “Look we have the same briefcase”, or in other words, “Look we are the same person”. 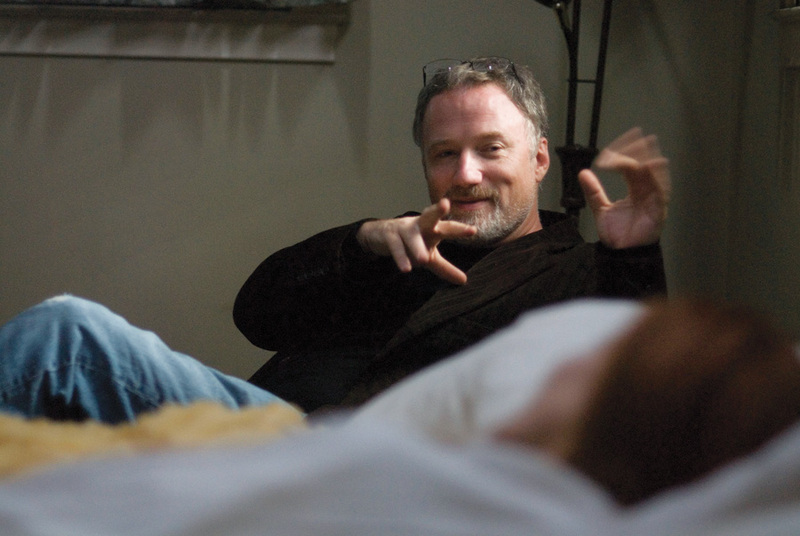 My second post discussing David Fincher as an auteur will focus on his depressing and negative endings which often show failure, sacrifice or suicide. It is a common thing for Fincher to involve himself with a film that is actually gritty, grim and dark such as Se7en, The Girl with the Dragon Tattoo and even The Game; however the endings and climax are always very important. Fincher’s first directing role in Alien 3 shows this, it’s a cruel horrible world inside this prison where you are only waiting for your imminent death which is slow and tiring. An alien creature invades along with a lost and injured Ripley, a female isolated in this male dominated society and world which sets up a very harsh storyline. However at the end of the film there is no victory or success for either the prisoners or Ripley who we follow throughout, following a spray of guns the prisoners are shot and Ripley commits sacrificial suicide as she jumps into a pit of burning flames. As an audience we have nothing to be happy about, our main characters are all dead and with no victory showing how rubbish and cruel the situation was. The same feeling is portrayed in the ending of The Girl with the Dragon Tattoo; throughout the film we follow the subplot which shows the growing relationship between our two main characters Mikael and Lisbeth. Lisbeth is someone who we feel very attached too and sympathetic towards, however at the end of the film dressed up and ready to meet Mikael she witnesses him leave with another woman leaving her distressed and upset. It is heart-breaking to watch, again there is no positive ending for the film or our character showing just how cruel this world is and society is. Se7en and Fight Club two of Fincher’s big classics and all-time greats also follow this same outlook and perspective, mainly focusing on suicide. At the end of Se7en our main character witnesses his wife’s head decapitated in box and then gets himself arrested for shooting her murderer which is the serial killer being chased throughout the film. We can only assume that Mills is going to spend the rest of his life in a prison cell, alone and hopeless yet he knew this would be the chosen path when he pulled the trigger on John Doe therefore technically committing suicide as he kills of his future. 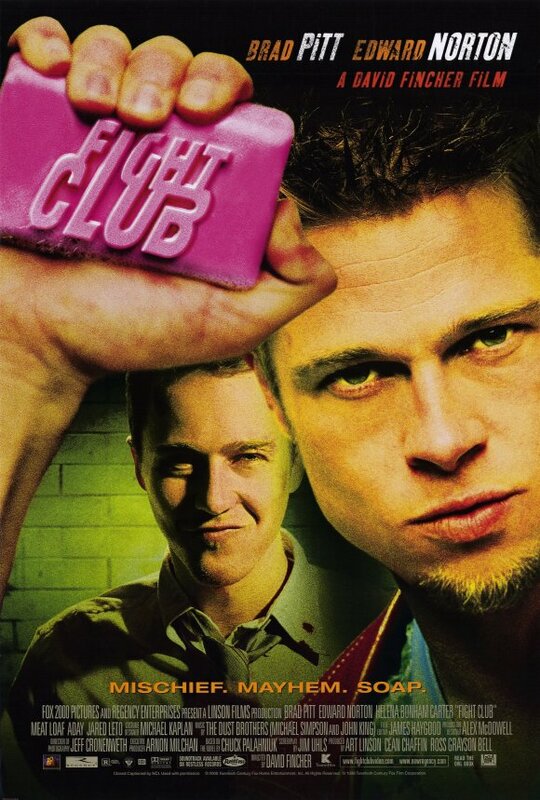 Fight Club has the similar ending after an emotional and somewhat crazy journey our main character stands with a gun in his mouth ready to end it all, the same situation in The Game. Fincher creates this very depressing feeling of injustice, giving the message that the good guys don’t win in society. Se7en even ends with Somerset’s lines “The world is a fine place and worth fighting for.” I agree with the second part.” This sums up the films and in a way Fincher’s message. It is fair to say that Fincher has a negative look on society and life in general especially in his first set of directing roles. It seems that if you want Fincher behind your film, you better make sure there are no happy endings and it isn’t a romantic comedy. Negative films and depressing endings are definitely and unarguably a trademark of David Fincher, if you didn’t see my last post on his representation of women click here.